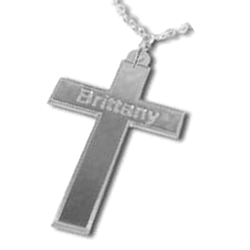 This sterling silver cross pendant with classy grooved edges will make a classic memorial necklace. Personalise it with the name of someone special and keep them close to your heart. A durable sterling silver rollo chain is included. Your chosen name will be engraved on the horizontal bar of the cross.